Unless you been living under a rock, or are one of those weird people who don't eat deep fried foods (in which case: what are you doing here?) you've heard about Moo Moo Chicken & Beer in Runcorn. Moo Moo is a small Korean restaurant located on Warrigal Road in Runcorn next to the very popular Gentosku Ramen. Their menu is a delicious assortment of Korean soups, stir frys, noodle dishes, and most importantly fried chicken! You see, Moo Moo has a reputation for serving up some of the best Korean fried chicken the river city has to offer. Fried chicken has long held a very special place in our hearts so for purely research purposes... we moseyed down to Runcorn to check it out. Moo Moo Chicken & Beer in Runcorn is serving up some of the crispiest fried chicken we have EVER EATEN. 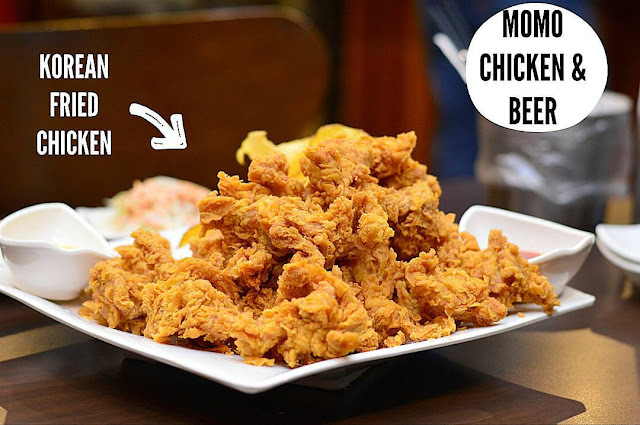 For just $27 guests can enjoy a whole boneless plate of deep fried chicken, homemade chips, 2 small sides, and dipping sauces ($26.50 with bone). Different marinade options are available such as soy and spicy... but being fried chicken purist we highly recommend you try regular first time around. These golden morsels of deep fried goodness are simply the best. Perfectly crispy and seasoned to perfection. But be warned once you try Moo Moo you may become addicted. Is This Brisbane's Most Extreme Cheese Pizza?